Outfit post time! I haven’t done one of these in sooooo long, mostly because I couldn’t find anywhere to take relatively ok full length pics in my Grandparents house (where I’m living at the moment). Last night when I went out I wore one of my all time favourite dresses. I’ve had this little black lace dress for about 4 and a half years. It was one of the first piece of really high quality vintage I ever purchased. The dress is by Ricci Michaels, a label I’ve never found out that much about but they did advertise in Vogue! I purchased this dress from Hope and Harlequin in Brighton. The dress was actually worn for the original owners engagement party in 1961! My earrings are in the shape of bunches of grapes. I purchased these (with their matching brooch!) from a car boot sale for 50p last year. 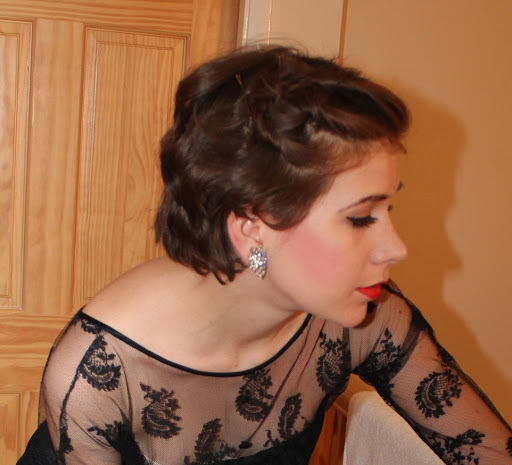 I’m wearing the dress here with my lotus Caribbean courts which date to the late 50s. 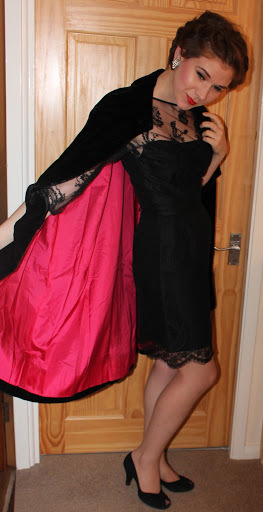 Finally i accessorised it with a vintage 60s velvet cape with really bright reddy pink lining. Gives the outfit a hint of Halloween feel! that dress is stunning! reminds me of one the new bond girl wears in Skyfall. Very dramatic and love a bit of cape action! What a lovely little black dress. Love your look! This is just AMAZING!!! simple and simply beautiful! Let the 60's come back!